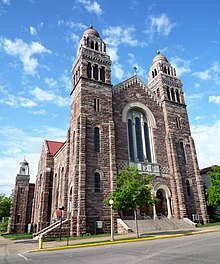 Ignatius Mrak is buried in St. Peter Cathedral, Marquette. Ignatius Mrak (10 or 16 October 1810 – January 2, 1901) was the second Roman Catholic Bishop of the Diocese of Marquette, in Michigan, United States. Mrak was born in the small village of Hotovlja in Upper Carniola, a province of the Duchy of Carniola (now in Slovenia), then part of the Austrian Empire. He studied philosophy at Ljubljana and then studied at the diocesan seminary in the same town. On August 13, 1837 he was ordained a priest by the Bishop of Ljubljana, Anton Aloys Wolf. In 1845 Mrak moved to the United States. He first ministered in Northern Michigan (at L'Arbre Croche, a mission settlement started by French Jesuits, and Peshawbestown). He served with his fellow Slovenian, the Rev. Francis Xavier Pierz. In 1851 Mrak moved to Minnesota, where he worked for nearly two decades, until 1869. He returned to Michigan that year after being appointed as Bishop of Sault Sainte Marie and Marquette, succeeding Fr. Frederic Baraga. Mrak retired as bishop on April 28, 1879. He was named titular bishop of Antinopolis. He remained in Marquette, where he died in 1901. ^ Shea, John Gilmary (1892). The Defenders of Our Faith. New York: Office of Catholic Publications. p. 291. ^ Ceglar, Charles A. (1992). Baragiana. Hamilton, Ontario: Baragiana Publishing. p. 300. ^ a b "Ignatius Mrak". Catholic Encyclopedia. Retrieved 16 November 2012. This article about an American Catholic bishop or archbishop is a stub. You can help Wikipedia by expanding it. This page was last edited on 2 January 2019, at 05:51 (UTC).